Anglers who choose to fish on our weekly Monster Fishing packages will have the opportunity to fish for four of the largest freshwater fish in the world which are found in Thailand. Our weekly specialist monster fishing packages allow anglers to fish for the legendary Giant Freshwater Stingray and Mekong Catfish which are both strong contenders for the world’s largest freshwater fish. These Monster Fish species have previously been caught at world record breaking weights with leviathans of both species being caught to 300kg’s in Thailand. Anglers choosing the weekly Monster angling package will also be able to target other native monster fish such as the world’s largest carp species the Giant Siamese Carp and the awesome Dog eating Chaophraya Catfish. 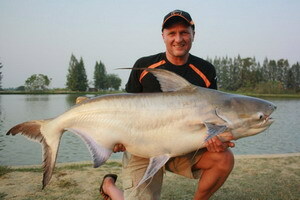 Both the Giant Siamese Carp and the Chaophraya Catfish are capable of attaining gigantic weights in the excess of a staggering 100kg’s.This multi venue package will also allow anglers to experience wild and authentic angling for Giant Snakeheads and other native fish species in the vast natural dams of Kanchanaburi province in central Thailand. Angler’s monster fishing for snakeheads will be surrounded by a wide variety of exotic flora and fauna in a stunning setting of lush green jungles and imposing limestone karst scenery. The Giant Snakehead is one of the most aggressive and ferocious predatory fish in Thailand and is the ultimate lure anglers quarry. The specialist weekly Monster angling package includes the unique opportunity to fish for non-indigenous species in Thailand giving the angler the chance to fish for the numerous South American monster fish species which have been imported into Thailand. The largest scaled freshwater fish in the world the fearsome Arapaima or Pirarucu is present in various fisheries throughout Thailand. 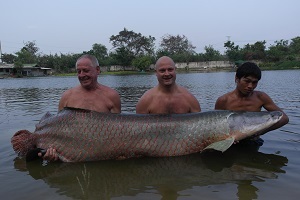 The Arapaima has been widely reported as attaining world record breaking weights of an estimated 200kg’s from several venues in Thailand. Targeting the Arapaima or Pirarucu has become increasingly popular in the last decade with anglers from all over the world travelling to Thailand in search of Monster Fish. 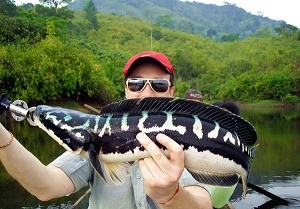 In addition to angling for Arapaima anglers fishing in Thailand can also experience the thrill of catching other non-indigenous predatory monster fish such as the extremely hard fighting and audacious Redtail Catfish and a whole host of other weird and wonderful monster fish species. Anglers choosing the Monster Fishing Thailand package will experience the exhilarating thrill of doing battle with four of the largest freshwater fish on the planet in addition to fishing for a wide variety of other monster fish. Our weekly Thailand Monster angling package is aimed at experienced anglers wishing to capture monster freshwater fish of world record proportions and to catch that monster fish of a lifetime. The angler will be guided throughout the day and will fish for both the largest Catfish and Carp species in the world at Bungsamran Lake In Bangkok.After angling for a full day the angler will be transported to riverside accommodation in Chachoengsao near the Ban Pakong River a short forty minute drive from Bangkok. Monster Fishing for Giant Freshwater Stingrays will commence at 07.00am at the Ban Pakong River. Anglers will be stingray fishing on the same record breaking stretch of river as seen on National Geographic channels Hooked Monster Fish Giant Stingray show. Giant Stingrays have been caught whilst angling on this tidal river by Fishsiam clients to record breaking proportions.The day will finish at 18.30pm when the angler will be transported to Samut Songkran Province and the Maeklong River accommodation. Angler’s Monster fishing for Giant Stingrays at the Maeklong River will fish for 6 hours in the same record breaking section of the Maeklong River as seen in National Geographic channels Hooked Monster Fish of Thailand Giant Stingray show. Angling time on the Maeklong River are dictated by tidal movements and lunar cycles and are timed to coincide with the most productive fishing periods for Giant Stingrays. After the day has finished the angler will be transported further into rural Thailand to Ratchaburi province and comfortable overnight accommodation. 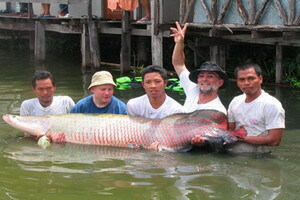 Fishing at Palm Tree Lagoon will commence at 08.00am and will allow the angler to fish for Arapaima or Pirarucu of world record breaking proportions.On arrival at the lake anglers will be equipped with both predator and carp fishing set-ups and will be fully guided throughout the days fishing. Palm Tree Lagoon has an impressive stocking of Arapaima and undoubtedly holds monster fish of various species.A full days angling at Palm Tree Lagoon can produce a wide variety of both native and imported species with the prospect of a monster fish a distinct possibility.Angling at Palm Tree Lagoon concludes at 19.00pm when the angler is transported further into Ratchaburi through a rural setting to basic accommodation near IT Lake Monsters. Fishing at IT Lake Monsters commences at 06.00am and will see anglers lure angling in the early part of the day.Lure fishing at IT Lake Monsters is highly prolific and produces a wide selection of both native and non-indigenous monster fish species.In the later part of the day anglers will change over to deadbaits or livebaits and target the larger predatory species such as Arapaima and Redtail Catfish.Large hauls of monster fish are captured on a regular basis whilst monster fishing at IT Lake Monsters using these methods.The day concludes at 18.00pm and will see the angler transported to the beautiful province of Kanchanaburi for overnight accommodation in floating bungalows. Monster fishing for Giant Snakeheads at Khao Laem Dam will commence at 06.00am and will see anglers fishing from authentic Thai longtail boats throughout the day.Clients will be transported to various parts of the lake to fish potential holding areas for the highly aggressive Giant Snakehead and other native predatory monster fish.Fishing for Giant Snakehead will conclude at 18.00pm when the angler will be returned to the floating bungalow accommodation. The final day of the Monster Fishing Thailand Holiday will be spent lure fishing for Giant Snakeheads and other native monster fish and will begin at 06.00am.Monster fishing for Giant Snakeheads will continue throughout the day seeing the angler further exploring the gigantic natural dam and National Park in search of monster fish.After fishing for monster Giant Snakeheads for a full day until 18.00pm the client will be returned to Bangkok airport or their Bangkok hotel in an air conditioned vehicle.